This is not a complicated recipe. You need fresh lemon, basil and spinach plus canned artichokes. The lemon and basil give a freshness to the dish; the artichokes a richness. I added nutritional yeast and tomatoes on serving and used artichokes mixed with olives, which worked well. I also added fresh spinach at the end as well as mixing spinach through when cooking. The meal was well received by my parents and Mr Bite. It was also enjoyed by Mini Bite, although her enjoyment included a great deal of play as well as the eating. Usually I cook her spiral pasta and she was thrilled with the extra mess made by spaghetti strands. Cook the spaghetti according to pack instructions (10 - 12 minutes). When the spaghetti is cooked, reserve 4 tablespoons of the cooking liquid. 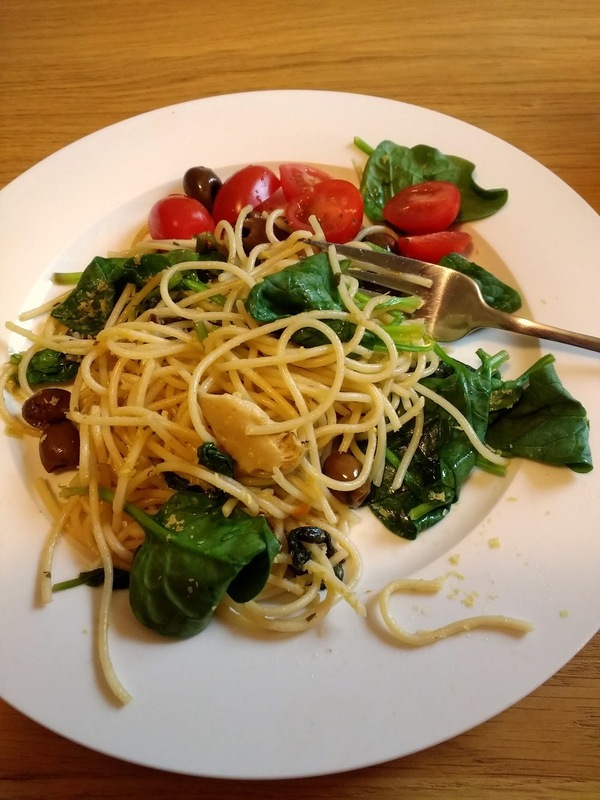 Combine the spaghetti, reserved liquid, artichokes in oil, lemon juice and zest, basil and 100g of the spinach leaves and stir to combine over medium heat. Season with salt and pepper as desired. 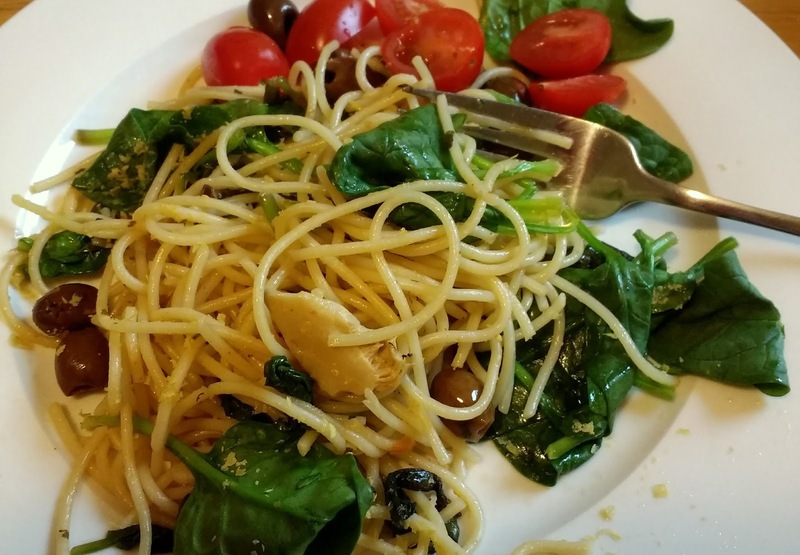 Serve with additional spinach leaves and tomatoes if desired. Sprinkle with nutritional yeast if desired. Do you have a go-to cookbook at the moment? 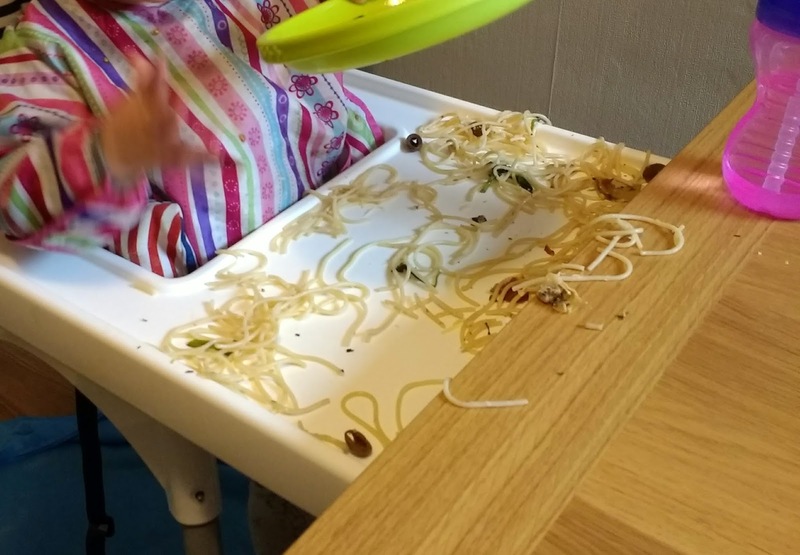 I love mini bite's high chair - spaghetti is fin for toddlers. I don't make spaghetti much but when I see this sort of dish I feel should amend my ways! What a messy little pup mini bite is :) I have this cookbooks, but don't think I have used it yet, I will have to take it off my shelf and cook at least one recipe from it next month. The spaghetti dish appeals, as it is an ingredient i go to for quick evening dishes, so who knows this might be the dish I make, thanks for sharing. It looks light and flavourful. I'm glad I could inspire you! I have tried quite a few recipes from here and also like the African stew a lot. Artichoke but no spaghetti suggests your kitchen is quite the fancy place at the moment! Yummo - this sounds like my kind of pasta. Mini Bite sure had fun with it! I really love all things lemon and we really love artichoke hearts. Yum. I will definitely be giving this a try - maybe topping it with homemade vegan parmesan.